September 6, 2007 at her home. UCC, on Tuesday, September 11, 2007 at 11:00 a.m. with the Reverend Nancy C.
to the service on Tuesday. enjoyed being an involved parent in her childrens¹ lives. To Mrs. Goertzen's family: I have many great memories of your mother. 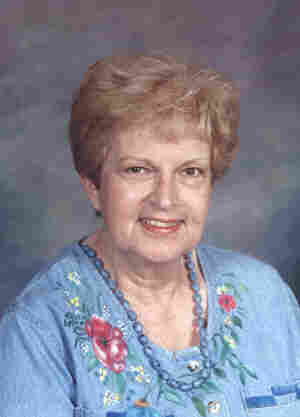 She was certainly my favorite teacher when I was a ninth grader in 1968-69. I always enjoyed my Home Ec class with her, especially the sewing unit, and my sewing skills today were the ones I learned from your mother, my mother knew how to sew, but never had the patience to pass that talent along to me. So, thank you for sharing part of your mom with me. This has been a sad time for my family also as my sister, Alta, is at this same time on the Boldt Memory Pages. You have my sympathy. Annette (Pofahl) Emory, Lakeville, MN FSHS Class of 1972. I was sorry to hear of your Mom's passing...she was a great lady and I have many fond memories of her as a teacher and as a parent of a friend. Having recently lost my mom, I share in your loss. May God's grace give you comfort at this time. Jim and Deb and family, I am so sorry to hear about your mom. She was such a great person. I was fortunate enough to have her as my Home Ec. teacher back in the "old days". I also enjoyed talking to her in the recent years about school issues and I appreciated her thoughts and guidance. I am sorry that I won't be able to be at her service but please know that I am sending you my thoughts and prayers your way.